This article was adapted from a lecture. Some 66 million years ago a planetoid about 6 miles in diameter hit the earth with an awesome, stupendous force. It was a disaster of tremendous magnitude. Winds of 200 to 300 miles per hour raced over the surface of the earth, and some 90% of the forests burned. The impact was probably accompanied by many erupting volcanoes, earthquakes and tidal waves of huge proportions. Smoke filled the sky and the temperature plummeted. These physical changes created another great change: They created one of the great mass extinctions of life on earth — no animal weighing over 50 lbs. survived. As far as can be determined, in terms of longevity, the dinosaurs were the most successful animal life-form ever to inhabit the earth; they had been on the earth for about 135 million years. By comparison the human species is, at most, only about 4 million years old. Today, a new disaster has hit the earth — Man. Technocracy Inc. has now been in existence long enough to see some of its worst fears coming to pass. Technocracy warned that if we continued the attempt to maintain our Price System and its attendant social forms despite the assault of technology and the application of the veritable tidal wave of energy necessary to run it, that we might very well be facing the very situation that we are facing today. In 1980, a presidential commission in the U.S. estimated that in the following 20 years some 2 million species of plants and animals will become extinct, and 5 billion new acres of desert will have been created. Man’s mindless wasting of the Earth’s bounty creates consequences not pleasant to contemplate. 6,000 sq. miles of forest are used up every year to furnish the Sunday edition of the New York Times; this requires 70 acres of trees. At least 20.3 billion tons of topsoil per year was washed to the sea, mostly due to the destruction of ground cover. Twenty years ago our worst fear was nuclear annihilation. We knew that if the initial blast didn’t kill us immediately, than we probably would face a slow and horrible death from radiation. We now know that if we managed to escape both those terrors, then slow starvation from an ensuing nuclear winter would most surely be our fate. Although most people in the world want peace and disarmament, we still do not have either peace or disarmament, and our generals still are planning and building for destruction: The cost of the Trident II submarine and the F-18 fighter program equal the estimated cost of cleaning up the 10,000 worst hazardous-waste- dumps in the U.S. The cost of 6 month’s outlay for nuclear warheads in fiscal year 1986 equaled all U.S. government expenditures for energy efficiency from 1980 to 1987. Many such comparisons are possible; to try for any comfort in this ridiculous situation, we relax assuming that we will be safe as long as no one pulls the trigger! But now — we are confronted with a danger at least as big! We are misusing our technology, and all we have to do to exceed past dangers is to continue doing what we have been doing in the past and our planet will become uninhabitable. It is that serious. The ozone layer that surrounds the earth absorbs ultraviolet light from the sun. It is this shield that makes life on earth possible. But the CFC (chlorofluorocarbon) compounds we are pumping into our atmosphere are destroying the earth’s ozone layer. The human species is, in effect, committing suicide! 25% of the CFC’s (aerosol propellants) are used to pump material out of containers so that consumers won’t have to open those containers or pump it out themselves. The Price System’s much vaunted “commercial competition” keeps business from stopping this practice. The only really important function these compounds fulfill is in their use as refrigerants, and every single one of those compounds can be replaced by something not harmful. This may happen as soon as business is sure of their competitive position. The only reason those facts were not discovered earlier is because no one cared to look. Where is the profit in looking for danger? But if we don’t do something about this problem soon, no other problems will matter! Most of the 70,000 toxins in commercial production are released into the environment without prior study. Technocracy adopted the monad as its symbol, standing for a balance between man and his environment. Today we are very far from anything like balance. Civilizations throughout history have collapsed for many reasons, and ignorance or simply ignoring the laws of nature is one very good reason. They overshot the limits set by nature. The civilization which occupied the valley of the Tigris and Euphrates Rivers was reputed to be the location of the Garden of Eden; it is now a desert. The number of ways our civilization appears headed to its doom are almost too numerous to count, but let’s try! 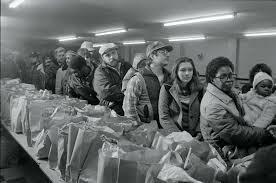 1988 was the first year in history in which the U.S. did not produce enough food for its own consumption. Forest productivity in cubic meters per year per capita peaked in 1967. Fisheries productivity in kilograms of fish caught per year per capita peaked in 1970. Grasslands productivity is indicated by the figures for wool, mutton and beef. Wool production peaked in 1960, mutton in 1972 and beef in 1976. Croplands productivity in kilograms of cereals per capita per year peaked in 1976. Annual world petroleum output per capita rose to an all time high in 1977. By burning huge amounts of carbon-based fuels in our cars, airplanes and electric power plants, we are changing the atmosphere’s heat intake. Between 1986 and 1988, production of food per capita fell 14% dropping back to the level of 1970. Much more will occur than a simple warming of climate. What this means is that the cycle has positive feedback. The warmer the climate becomes, the more trees will be destroyed, and they are the prime sources of oxygen and carbon fixation. Exactly the same is true for the formation of deserts. The causes of the formation of deserts are overgrazing, over cultivation, Stalinization and deforestation. Once the ground cover is stripped off, the ground dries up and reflects much more of the sunlight back to the atmosphere. This dries out the air so that less rain falls, and then the desert expands. The five hottest years in this century were all in the 1980s. The greenhouse warming is well underway, and threatens to inundate much of the most productive agricultural land now in use and to turn much of what is left into desert. As our population continues to grow exponentially, problems are magnified. Annual growth currently adds 70 million to the earth’s human population. Something like a century ago Thomas Malthus predicted that population control would be by world-wide starvation. He was called a merchant of gloom and doom or worse. American economist Daniel Raymond, in 1980, said of his ideas: “Although his (Malthus’) theory is founded upon principles of nature, and although it is impossible to discover any flaws in his reasoning, yet the mind instinctively revolts at the conclusions to which he conducts it, and we are disposed to reject the theory, even though we are given no good reason.” Today, economists are rereading Malthus, not Raymond. Ecologically acceptable hydropower could quickly be developed to replace coal and oilburning plants. The Continental Hydrology plan proposed by Technocracy over 50 years ago could be installed, slowing down and making better use of our fresh water resources, recharging aquifers and adding more plant life. Geothermal power adds nothing to the atmosphere, and the power potential is large. Fuel cells can convert hydrocarbons to electricity much more efficiently than the oil and coal-burning combustion systems now in use. There are many other ways to produce energy, all of them not as profitable to private enterprise as those presently used. Problems have grown bigger and more unmanageable, problems that arose from living in a technological environment with methods of social control that did not fit the situation. Examination of any of those problems can be gone into in greater depth than we have space for here, and, in every case, you will see that the influence on the problem by the Price System is negative. None of those problems are likely to be met with more than token solutions as long as we have a Price System under which one’s frantic interest is profit and the quarterly bottom line. We, all of us, need Technocracy.